What is a Canvas Feature Request? 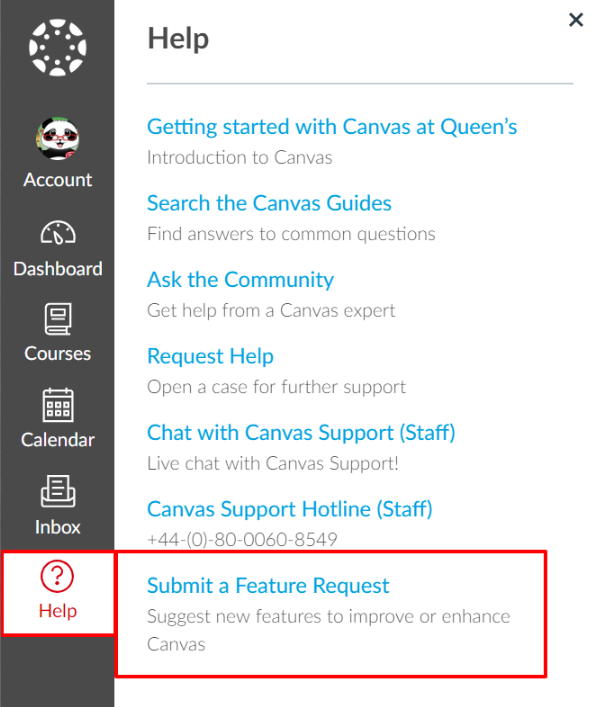 The Feature Request Process allows you to suggest new features to improve or enhance Queen’s Virtual Learning Environment Canvas. What happens once my Feature Request has been submitted? The Feature Request process will undergo a number of stages and will depend on the development/deployment of features by Canvas, review & assessment against policies in particular GDPR, review/assessment of other support required (in particular where Third Party Companies are involved) and the total number of requests received. The current priority is the Canvas rollout and support of live modules currently using Canvas. Where there is availability, feature requests will be analysed and investigated, we thank you for your patience with this process. In the meantime please proceed to develop in Canvas using the functionality available. When your request has been prioritised for further investigation the request will go through an approval process to determine if and how the request will be actioned. Click on the individual stages to view more information about the Feature Request Process below. • A log of the request through the Feature Request Form. • Gathering of requirements to make sure the request is understood by the team. If not, we will reach out to you to clarify your request further. • If there is an alternative application that can be integrated with Canvas that meets University Policies and can be supported. • We have the opportunity to provide input into the development of features & functions, to assist in continuously improving the learning & teaching experience within Canvas. • Canvas has a high level of direct support available for both Students and Staff to contact 24/7/365 via multiple channels of support. • It will avoid duplication of similar types of activities, providing a level of consistency and a better user experience for students. • There are no current additional costs associated with using Canvas existing functionality or functionality that will be implemented into Canvas production. • There will be less impact during Canvas Updates. • Release of a new feature from Queen’s Customer Success Manager at Instructure. • New development requests raised to Instructure. These requests are then voted on within the community & User Groups. 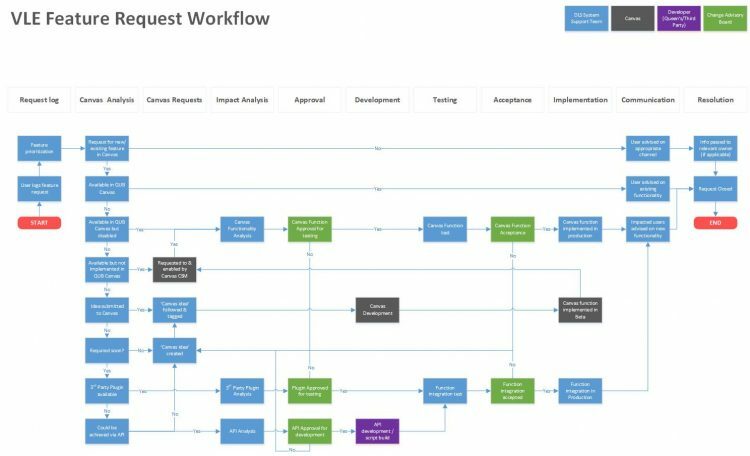 To increase the visibility of the development requests, we will share this with the UK User Group and encourage you to get your peers and colleagues to vote on the request. • Requires additional internal resources for developing/testing/implementing (where applicable). The analysis will be presented to the Change Advisory Board where a decision will be made on how to proceed with the request. This stage identifies the development work completed by Canvas. Queen’s University Belfast will not undertake any development efforts within Canvas with the exception of any approved API developments by the Change Advisory Board. API developments are reserved for developments outside of Canvas. In this stage, testing will take place in a non-production environment and a report will be produced identifying any issues/errors caused by the new feature. This is completed to ensure the feature functions as expected prior to implementation into production. The Change Advisory Board will make a decision on whether to implement the feature in production based on the testing report and previous analysis. This stage will implement the feature into Canvas. Implementation into the live environment must first be accepted and approved by the Change Advisory Board. Communication will depend on the feature request raised. • If the feature is already available within Queen’s Canvas, then the user will be advised of the existing functionality and will receive documentation on how to use it. • If the feature is newly implemented into Queen’s Canvas, then all affected users will receive communications via Canvas Updates. • If the feature has not been approved for implementation, staff members who originally requested the feature will be informed of the reason for closure. At this final stage, requests are closed and archived. What are the priority Canvas Improvements? The Canvas Community provides the opportunity to view, explore and contribute to the current development priorities for Canvas. Click here for further information. The Canvas Higher Education UK User Group meet on a quarterly basis to discuss the Feature Requests relevant across Higher Education UK Institutions using Canvas. The Top 10 development priorities are listed below. This request is to make improvements to the Canvas Anonymous & Moderated Marking capabilities. Anonymous Marking in Canvas provides the ability for assignments to be marked anonymously. Moderated Marking in Canvas provides the ability to set a particular number of graders for the assignment and assign a Final grader to determine the Final Grade. The UK HE Usergroup would like the option to mute assignments by default so that all students receive grades and feedback at the same time. Instructure are currently looking into how this could be achieved within Canvas. Once designs have been completed, these are typically shared to provide feedback. This request is to provide the option to Download all feedback. Once designs have been completed, these are typically shared to provide feedback. Queen’s Digital Learning Solutions Team are currently in contact with the UK User Group to understand what has been requested as part of this feature. Once designs have been completed, these are typically shared to provide feedback. The Quizzes.next tool will be the new Canvas Quizzing tool in the future and will replace the current functionality. This quizzing tool will offer new functionality to Canvas such as ‘hotspot’ question types. This tool however does not currently include a variety of questions available in the current Quizzing tool such as; surveys, multiple responses, drop down lists, likert scale, etc. Other current limitations include; cannot export, doesn’t work with student view, no accessibility checker, does not work with Respondus LockDown browser. General Availability (GA) work completed. Due to current limitations in using this new feature, feedback has been provided to Instructure for development improvements. This feature will be re-assessed for release, once further development has occurred. This request is part of the Anon & Moderated Marking feature. The UserGroup would like the ability to restrict the setting to turn on/off Anonymous Marking through a permission in Canvas. This permission can be set to particular user roles. This is a new request and has not yet been explored further with Instructure. As part of the UK UserGroup, we would like the option to have the possibility of building a bank of feedback that can be used to insert regularly/commonly used feedback when marking assignments. As part of the discovery phase, Instructure will gather requirements for the ‘Quickmarks’ feature. The Canvas Community has a range of ideas across Global Educational Institutions. Get involved by voting for your favourite ideas here.